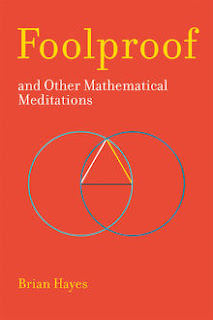 MathTango... : Overview... "Foolproof, and Other Mathematical Meditations"
Overview... "Foolproof, and Other Mathematical Meditations"
"Mathematics is too important and too much fun to be left to the mathematicians." A common joke when I was growing up reading Scientific American, was that the magazine was just a wrapper for getting Martin Gardner’s monthly column into your mailbox. No doubt there literally were some readers who subscribed to the magazine just for Gardner's column. His writing was succinct, descriptive, intriguing, on topics that were unpredictable from month-to-month. Another reason I think many loved Gardner was that he was NOT a mathematician (if memory serves me right he never even took an academic math class after high school) — it gave some hope that non-professional math enthusiasts could still contribute to the field or at least communicate some math to others (in the sciences usually astronomy is often cited as one of the only areas where ‘amateurs’ have a fair chance of making a significant contribution). Anyway, I mention all this now because Brian Hayes’ writing, to my sense, has the ring of Gardner’s popular writing. In fact, when I interviewed Hayes awhile back, I specifically asked if he consciously copied Gardner’s style (he overlapped with Gardner, working at Scientific American). He admitted, like so many, being a huge fan of Gardner, but said he never deliberately tried to mimic Gardner’s craft — but took my question as the compliment it was meant to be. Still, as I read these ‘Foolproof’ essays I could almost hear Gardner’s voice in the background. Martin’s writing was more “recreational,” perhaps even casual, while Hayes has a more technical or academic bent to it, but still the style and step-by-step presentation are similar. And the resemblance goes beyond their meticulous exposition, as Hayes too is not a professional mathematician, just a sort of dabbler in it, who like Gardner, is unpredictable in what topic may capture his interest next. Enough about all that. Hayes' new book is a delight… with one shortcoming: at 200 pages and 13 essays it is too SHORT. I don’t know what the criteria was for essays that made it into this volume, but plenty of good Hayes material is left out. Every offering here contains interesting little gems or tidbits that I suspect a math teacher could incorporate into a classroom discussion at the middle or high school level, while also containing many bits for the professional mathematician to mull over. Computer science is Hayes’ specialty, so several of the pieces are focused there. My own favorites, in addition to “Foolproof" though are the more mathematically-inclined pieces, including: “The Spectrum of Riemannium,” “Playing Ball in the nth Dimension,” and “Quasirandom Ramblings.” But your own favorites will depend on your own proclivities as Hayes jumps around from one wild, quirky musing to another, on biography, method, pure and applied math: Gauss, arithmetic, Sudoku, space-filling curves, statistics, Markov chains, pi, computer software, randomness, math history, the abc conjecture, and more are here… almost always dipping in deep enough at some point to make you slow down in order to grasp what he's positing. Finally, Hayes’ dedication for the book reads: “To the mathematics community that has taught me and charmed me.” He constantly returns that charm in spades.